I seem to have heard a lot recently about how design can be used to increase democratic engagement. This is often a feature of election years – but the angst of this particular political moment seems to have upped the stakes. It came up at the last Design Culture Salon on citizenship and consumerism, at the ProtoPublics sprint workshop last week, and in the Design Commission’s recent essay collection, to name a few instances. The idea is expressed in varying terms, and could mean anything from making political parties more approachable or creative, to enabling new kinds of democratic participation through digital means, or even devolving power to new political and democratic forms (top of Nicola Sturgeon’s to do list in Scotland apparently). What it often boils down to, though, is making the process of registering to vote, and voting itself, less awkward. There are indeed probably hundreds of ways we could use design to make engaging with the electoral system more user friendly. But should we? Well of course on the face of it this sounds sensible. This year I was one of the millions who glided seamlessly through the new online registration process (thank you, GDS). But in the back of my mind a little voice is playing devil’s advocate. Is this one of those spaces where design should think before it treads – or at least be very self-conscious about which values it leaves at the door? While I here risk sounding like a privileged white person failing to appreciate the barriers to democratic engagement for other demographics, this gut feeling was corroborated this week by something I heard from two philosophers (also, admittedly, privileged white people), Matthew Crawford and Richard Sennett, discussing Crawford’s new book. ‘The World Beyond Your Head’ revolves around a feature of the contemporary condition I’m sure we all recognise – the problems of constant distraction and fragmented attention. He proposes the idea of attention as a resource (collectively we share an ‘attentional commons’), which is in the 21st century being ‘aggressively appropriated by private interests’. Public spaces, spare moments in our lives, and spare corners of our screens are filling up with advertising, often targeted. This is pitched to us in the language of freedom – those offering us choice are only trying to increase our individual liberty. Possibly, but constant bombardment can also leave us feeling that we have little control. He argues that we should much more actively demand and protect our right ‘not to be addressed’, our right to silence, and space – prerequisites for the ability to think. In his talk he then made a little conceptual leap to the development of skilled practice (harking back to his first craft-oriented book) as a mode of engaging with things meaningfully, of generating agency, creating moments of sustained attention, of joining the world (not fleeing it) by investing in something difficult. However for the purposes of this discussion I want to stick with the idea of how we choose to ‘spend’ our attention. Both Sennett and Crawford referenced a theory of attention being commanded by ‘difficult’ things, and positioned ‘user friendliness’ as against cultivating attention. The language of ‘user friendly’ comes philosophically from an individualistic view of the world in which we all have unfettered choice, and are free agents whose attention has to be captured and monetised. Making something user friendly means removing all the barriers, reducing the required investment of time or thinking on the part of the individual, and making it as likely as possible for someone to do what it is you want them to do. The perma-culture of user friendly tells us that we don’t need to know how to engage skilfully with the world, as someone else will smooth out the creases and hand us the packaged version. 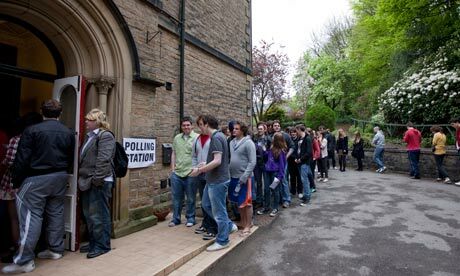 So perhaps we should resist the concept of ‘user friendly’ when it comes to politics, democracy – and voting. Democracy has been hard won, politics (by which I mean the constantly unfolding act of negotiating how we live together) is serious, complex and difficult, and citizenship is a privilege. Why should it all be made to seem unproblematic, or rightfully ours, or handed to us on a plate? And on what basis do we think making voting user-friendly would increase meaningful political engagement anyway? This proposition seems to be addressing the issue from the wrong direction. Instead of using design to smooth the edges of a single interaction between citizen and state, perhaps, if political apathy is a problem, we ought to be thinking about how people can become more skilled in the practice of citizenship. Rather than asking how we can just get people to vote, we should be asking rather how we generate sustained attentiveness to the question of being a citizen. Last week the RSA published a report I co-wrote for them, looking back on 90 years of their Student Design Awards scheme. There are more official blogs here and here about it, and you can of course read the (quite fascinating) report itself here. However if you don’t have time for the whole thing, you can either read pages 11-14, which pretty much sum it up, or read on for some bitesize takeaways, also known as ‘my favourite things that I learned from working on this report’. Who knew (well probably lots of people), but the RSA was fundamentally about design from the very start, although it wasn’t termed as such. The Awards and its other design work are only one of many things it does today, but in 1754 the organisation was initiated on an agenda of eliciting innovations and inventions from the public that would solve the some big problems facing the nation. These competitions were called ‘premiums’, and clever ideas were sought across the domains of: manufacturing, agriculture, trade, the ‘polite’ arts, chemistry and mechanics. After a while the RSA diversified into other activities, but the idea of triggering creative responses to a brief, and the importance of drawing, and other artistic skills, have always been somewhere in its DNA. This is all the more remarkable given the number of other initiatives instigated by the RSA that have spun out, been taken on by others, or simply ran their course. Design has been quite tenacious, which I think says something about its universality as a mode of human endeavour and practice. If you ever needed convincing that the idea of ‘the zeitgeist’ is actually a thing – trawling through 90 years of design briefs and projects might just do it. I’m a big fan of understanding design in its historical, social, cultural and political context. I’m less interested in the design itself, and more in what it tells you about the world in which it was made. In the Awards in the ‘20s you can see the vestiges of 19th century belief that the environment had the power to enlighten or corrupt, as – against a backdrop of far too many things of German provenance invading the homes of Britain – artists and makers were encouraged to design domestic and decorative objects that would crowd out foreign imports. Post WWII, it all gets very utilitarian as the nation tried to rebuild itself. Not a decorative porcelain figurine in sight: ‘solid fuel burning appliances’ were called for. The end of the 20th century was dominated by the rise of the computer, businesses worrying about ‘customer experience’, and environmental concerns becoming mainstream. More recently the awards have reflected widespread concerns about the damage inflicted on the environment and society by the designs of yesteryear, as well as the increasing agency and autonomy citizens expect in their own lives. …it’s not immediately clear that only those grounded in a craft-based training are qualified to act here, and in fact a traditional design education may omit a few important things. Finally, we are now, apparently, in the era of ‘the system’. The challenges of the 21st century will be ones of scale and complexity – so really we should all get involved in solving them. This idea is already being embodied by a wave of problem-solving initiatives such as global jams and hackathons, open innovation challenges, and projects that crowdsource scientific and creative work. Perhaps the next stage then for the Student Design Awards is to open up beyond designers? If you’re looking for some inspiration, you can check out this year’s briefs here. This article originally appeared in a shorter form on Creative Economy 2015. George Osborne should be pleased with himself for coining the phrase ‘the march of the makers’. He has certainly rolled it off his tongue plenty of times, and it has usefully reminded us all that we shouldn’t forget about manufacturing, which has for so long been cast into the policy wilderness. But the government’s support for the ‘makers’ has been more about attracting investment into the automotive industry, or moderating energy prices, rather than bolstering an army of craftspeople tinkering in sheds. For the creative industries, the term ‘makers’ signifies something quite different from what the Treasury might think. Not steel magnates, chemical suppliers or factory owners, but artisans and inventors. Although statistics around this amorphous movement are hard to come by, there are clear indicators that something important is happening. The phenomenon of the communal workshop is taking off, under various names: there are now thousands of ‘hackspaces’, ‘maker spaces’, or ‘fab labs’ globally. The Fab Lab began life in MIT’s Media Lab in 2001, and there are now some 307 worldwide. Prominent UK maker spaces include Makerversity, bunkered under Somerset House, the Blackhorse Workshop in Walthamstow, and Fab Labs in Manchester and Liverpool, Edinburgh and Glasgow. There is also the hybrid concept Maker Library Network, embryonic at the moment but growing. Taken together these efforts are partly about providing much needed work facilities for small or single-person businesses in the creative/ manufacturing sector, and partly about allowing the wider community to delve into what is usually the outsourced function of making and fixing. Other signs of the maker revolution include trendy blogs – for example http://makeworks.co.uk/, http://makeitbritish.co.uk/ – about the pioneers/ rebels who are obstinately still making stuff in the UK. Internationally we have seen the rise of Etsy, the online marketplace for makers that launched in 2005, and by the end of last year had 30 million users and US$1 billion of transactions. These grassroots-driven platforms are slowly shaking off the crusty old (male) notion of manufacturing as a dirty industry devoid of human hand – and often drawing the connection back between craft and manufacturing. We’re also seeing the emergence of new ‘blended’ businesses – which are often labelled ‘tech’ – but are in reality more of a hybrid between design-digital-craft-tech-fabrication. The Brighton Fuse project highlighted this new blended kind of activity nicely, but in general it’s something we don’t seem to have the right policy/ industrial language to describe yet. Over the last couple of years I’ve met digital start-ups that quaintly describe themselves as ‘foundries’, and businesses (very often in ‘tech city’) that work across what we would traditionally think of as manufacturing, craft, the arts. These businesses embody the spirit of experiment that characterised the first industrial revolution far more than those established manufacturing businesses that are the descendants of it. What can we learn from these places/ collectives/ trends? Is it a passing fashion – or is there some deeper systemic change going on? Perhaps, as we move into the digital world, we’re all craving an enhanced connection with the material. It’s also interesting to note the open source/ sharing approach of this movement: might we see hackspaces as the coffee houses of the 21st century? With a predominant demographic of digital/ social media natives, it’s certainly a far more open and social community than the traditional manufacturing sector. The ethos of the movement is congruent with a wider rebellion against traditional economies, the people-powered move towards ‘collaborative consumption’. And it is a timely reminder in a period of increasing privatisation of city space that cities work best when they are about sharing resources. All in all – this should be seen as a good thing. This is about rebellion against outsourcing and having no idea how the things we depend on in the western world are made. It’s about democratising production and distribution. And it’s about providing spaces that nurture creative activity in an inclusive way. So – as an alternative spin on Osborne’s policies for makers – how can this resurgence of making be nurtured? Above all else, the maker movement needs space. Creative makers are increasingly being priced out of city centres even though the ideas and inventiveness they bring are what make cities exciting, successful places. Planning regulations need to resist the rush to residential and generic commercial development, and local authorities should be prepared to do more to provide and protect the kind of light industrial workspaces that are needed. Many of the best publicly provided facilities, from kilns to soldering irons, are found in school and FE college design and technology labs, and these should be made more widely available at out-of-hours times. Other community facilities could also be put to use – might libraries’ mandate to provide public access to knowledge extend to ‘knowledge of making’? More broadly, industrial policy needs to be hauled into the 21st century. I would be amazed if many civil servants had thought deeply about the maker movement, or the idea of the fused/ blended business, their significance and their relationship to traditional manufacturing. We need to update our language, our thinking and our departmental structures, to shake off the false dichotomy between ‘the creative industries’ and other parts of the economy. If innovation policy only focuses on the narrow measure of economic growth via the unhelpfully termed ‘high-tech’, it will miss much of the innovation that promises to revitalize not just the creative economy, but towns, cities and the country as a whole. The last time I visited Paris, my travelling companion was decidedly disappointed by the place. He complained that the city had none of the life and sparkle and bustle he’d been led to expect. I knew what he meant and I suspect it’s a common experience. Paris is a great city to visit if you’re interested in the history of Paris – but it’s rarely the slightly twee, romantic, ‘gaye Paree’ that’s so often depicted in films. Recently this seems to have become more of a public concern. The newly elected (socialist) city mayor, Anne Hidalgo, has pledged to tackle the housing problem that is forcing a middle and working class exodus to the hinterlands. This social homogenisation of the city is unfortunate for many reasons, and one big one is the negative impact on its vitality and creativity. Paris boasts few artists of international recognition, it has a Ministry of Culture that seems to do anything in its bureaucratic power to keep Paris from progressing, and French nationals occupy every notable cultural post… Paris proper seems to be slowly atrophying, a muscle that has long ago stopped being able to afford to pick up a pen or paintbrush. The piece suggests (among other things) that the city’s cultural policy is too tied to memorialising its glorious past – because there are millions of tourist euros to be earned that way. (It’s striking that another of Hidalgo’s first major announcements is a revamp of the 125 year old Eiffel Tower.) But this means that the living city is slowly ossifying into a monument to a former period of great creativity, rather than continuing to be a fount of creativity today. There was a real melancholy about the place – people were saying how it feels so staid against cities like London that are constantly changing. In London we lament the loss of the true East End character to the hipsters, but in Paris they are still sitting about in cafes in Montmartre like they always have, and they’re bored of it. There are two things I think about all this. First, London should be wary of any superiority in the creativity stakes. Its own inexorable property price rises may well be driving it the same way, as this Guardian piece by Alex Proud points out. But – second – I wonder whether Paris has become a victim of its own impossible reputation, and is being unfairly judged. There are a number of reasons to suspect this is the case. Paris, and the life of Paris, has been mythologised like no other city, in paintings, books, and films, and by actual historians – who can’t let it alone but are constantly ‘re-reading’ and re-telling its significant moments. The imaginary city – the one tourists have in their head when they flock there – is a rich accumulation of all these things, layers of fact and fiction and speculation. The real city is disappointingly solid and one-dimensional by comparison. I was quite prepared, on the occasion of my last trip, for the unavoidable difference between the Paris of the mind – exotic, chic, the city of lights, of dancing girls, intellectuals and artists in garretts – and the realities of a modern capital city. But still it’s an anti-climax to find that the place you’ve been hoping to at least catch a glimpse of doesn’t really exist. So, we then should ask ourselves, did it ever really exist? Or has it been exaggerated by story-tellers all along? Looking back to its periods of great flowering – the Belle Époque, the fin de siècle, the early 20th century – undoubtedly a lot of interesting stuff happened in a relatively short period of time. All sorts of inventions and breakthroughs started life in Paris: in technology (the Eiffel Tower, escalators, diesel engines), art (countless rebellions and movements), design (art nouveau), psychology (think Bernheim, Charcot, Freud), commerce (advertising, department stores) – and all this alongside rapid social change. It is just this, and the fact that the arts at the time were socially so prominent, that makes historians and art historians obsess about it. But hindsight probably exaggerates the sense of compression, and powerful narratives around certain remarkable places (Montmartre) and events (the Worlds Fairs) seep into our picture of the whole period. A third thought: this great explosion of progress was not unique to Paris. Rather it was a feature of a particular moment in history. Other European capital cities were being catapulted into the modern world in the same way at the same time (we just idolise them much less, for some reason). And few of them in their contemporary state – carefully governed, regulated, constantly surveilled, expensive to live in, and subject to the pressures of global capitalism – embody much of their former creative, disruptive selves. We shouldn’t over-penalise Paris for being the same. Finally: the accusation that the current cultural administration is backward-facing and protectionist doesn’t distinguish it from previous cultural administrations. The arts in France have traditionally been ruled by an inherently conservative bureaucracy (against which certain artists rebelled of course). Something like Art Nouveau – the powerful imagery that frames our thoughts of this exotic time – grew out of a government-backed project to revive the French luxury goods industry by resurrecting ‘the Rococo’ (the favoured royal house style from over 100 years previously). It was a very historicist project, and it was specifically about protecting the Frenchness of French industry. So: although it’s terribly depressing that in real life none of us can do an Owen Wilson (ie be transported back in time to hang out with Gertrude Stein, Hemingway and friends, courtesy of Woody Allen), we must be careful to separate this from reasonable criticism of the city. And perhaps visits should come with some sort of advisory warning: if you’re looking for the Paris of your imagination, it’s more likely to be found in a library. I’ve been thinking about this revolution à la Russell Brand business recently. He hasn’t historically been known for exercising excellent judgement, however in this case, somewhere buried in all the posturing, is a very valid point. The symptoms are clear: the British public are undoubtedly disengaging themselves from politics. Voter turnout is falling, as is membership of the main political parties. Facts which pose both a legitimacy and a solvency problem for British politics. On the other hand: the National Trust isn’t struggling for members: a fact frequently cited as evidence that Brits are still willing to engage in a wider public life and community. We’re just, seemingly, not that enamoured of politics. Brand’s cure-all is revolution: a slightly impractical answer that doesn’t address the very real challenge of ensuring we have a legitimate way of getting a government. However, one only has to watch the news or read a paper or even probably ask a random person on the street to ascertain that he is indeed correct in his observation that most of the British public don’t care for politicians. His own diagnosis mainly revolves around the idea that politicians are all corrupt, self-serving ne’er-do-wells, in the pockets of big business and the city. This is a very compelling and easily-swallowed argument. But my own experience of politicians – and I’ve worked with a few in recent years – doesn’t bear this out at all. Many of them are hard-working, decent, and public-spirited: so why isn’t this their popular image? Well, there are a few rotten apples, giving the rest a bad name. And some have just made silly mistakes. But I think the public would be less inclined to believe that all politicians are ‘on the take’ if they weren’t already so fed up with the political class in general. It is already a faltering relationship. And there is one particular feature which, as with all troubled relationships, I suspect might be causing the lion’s share of the problem: communication. Communication involves two parties – at least – so let’s start by thinking about ourselves. The problems we’re having aren’t only to do with the kinds of people that become politicians. It’s us as well. We’ve changed. Brand may lament the lack of leaderliness in our leaders, but I’m not sure we want to be led in the same way any more. I recently visited Churchill’s house, Chartwell (National Trust member that I am), which is stuffed with memorabilia and records of his time in power. I reflected on the train home that not only was Churchill a very different kind of politician, but he was dealing with a different kind of public – one that didn’t know about (or turned a blind eye to) the fact that he was, for example, drunk most of the time. Today, our expectations of communication have changed. We want to be informed, to be consulted. Social media has given us all a voice: we no longer expect to be mute subjects on the receiving end of a broadcast. And we have learnt from the experience of our consumer lives that we can expect to be put at the centre of things. To receive services that wrap around us, fit into our lives. To return then to the accused party: I can’t think of any way that mainstream politics has meaningfully responded to any of these changes in the world (and MPs being on twitter doesn’t count). It hasn’t adapted. For starters: it hasn’t updated its tone of voice. Ed Miliband’s conference speech was a case in point. Although the party faithful sitting behind him on camera were all nodding and clapping approvingly at his oratorical skills, I’m pretty sure that to most of the rest of us, he sounded like a parody of a sanctimonious sixth form debating captain. Every time he rhetorically paused and closed his eyes for emphasis I cringed. What an odd, archaic manner of speaking. And Mili-E is by no means the only guilty party. Secondly, the political classes don’t seem to have cottoned on to the fact that most people are now quite sophisticated in their understanding of political communication, and can spot a dissimulating answer a mile off. Those old rhetorical tactics aren’t fooling anyone any more, so continuing to employ them encourages the fiction that all politicians are liars. Thirdly, they collectively appear to be choosing to ignore the damage that party political bickering does to politics in general. For example, one may, as an innocent member of the public, switch on Prime Minister’s Questions expecting to hear intelligent and reasoned debate about how the country ought to be run: a great and serious matter. How disillusioned you would be to realise what you’ve actually stumbled upon is a window onto a rarefied members’ club where the main business seems to be jeering, name-calling and petty one-upmanship. Actually – internally – this is a system that sort of works because all the players know the rules. It’s more sophisticated than it seems. But to the outsider it looks like a highly disfunctional waste of taxpayers’ money. 1. Stop campaigning all the time (and collaborate). No one listens when politicians use parliamentary questions – or any other platform – to big up their own track record, because no one believes anyone who is always the hero of their own story. They could be nudged into dropping this habit quite easily: the Speaker could instigate a new rule, a matter of parliamentary etiquette, that unless we’re very close to an election, campaigning and scoring party political points in the Chamber is considered an abuse of parliamentary time. They may disagree, by all means, but must do so constructively. To win back public confidence they must demonstrate that ultimately they’re all working together – collaborating – to solve the problems of the day. Opposing as a matter of principle is tedious and transparent. This means responding to what people are actually saying, or asking, rather than waiting for them to finish speaking so you can say what you were always going to say anyway. It means admitting when you made a mistake or got something wrong. And it means being yourself. The popular politicians tend to be those who have a demonstrable personality – who don’t try to be an everyman. In practice, this may require a relaxing of party lines: under the informal rules about how far one may deviate from the received wisdom without losing your party’s support, those who speak their minds don’t last too long. Or it may just mean we need a greater plurality of parties. Allow people to participate in politics. Ask them what they think, and show that you have understood their answer – even if you disagree. Emailing constituents to canvass opinions before a vote is a great idea. It’s surprising how often people won’t mind a different outcome as long as they were asked their opinion as part of a democratic process. All this is important because we absolutely need a healthy, happy, functioning democracy. Collaboration, which means good communication, is the only way we’ll get there. I’ve just spent the last few months in 1890s France (or at least in the library studying 1890s France, for the purposes of an MA). This is a period more glamorously known as the fin-de-siècle, a generic French term which has stuck to this particular ‘end of the century’, perhaps because the turn from the 19th to the 20th century saw such momentous change, and Paris was its artistic hub. The fin-de-siècle has a very particular allure in my opinion: close enough in time and technology to be very well-documented, but long enough ago to be a startlingly different place. Socially: modern and medieval in equal measure. And indisputably a time of grand visions the like of which we’ll never see again. It was also an interesting moment in the history of industrialisation. I was reading about design – and the dominant movement at that time of art nouveau – and I was struck by the loaded ways in which objects were described by contemporary critics. People got really upset (or ecstatic) about the design of things as (seemingly) insignificant as chairs and wallpaper. Interior design was such a matter of national significance that a mainstream journalist was heard to say that one particular art nouveau room ‘reeked of the vicious Englishman, the morphine-addicted jewess, or the crafty Belgian.’ It’s hard to imagine anyone describing design in such xenophobically charged terms nowadays – or even caring that much. Although it’s not mentioned in the above quote, actually the most problematic nation for France at this point was Germany. Not because of what came later, but because of what had just happened. Germany had wiped the floor with France both militarily and economically in the late nineteenth century, and their population was growing alarmingly fast, all of which came as a rather unpleasant surprise to France. And it led to all sorts of German-centred neuroses: around power, health, virility, and the question of how and with what France could still assert its superiority in some way. I think the answer for the French was art nouveau. For hundreds of years they had been used to seeing themselves as global ‘tastemakers’, and the one asset they could still flaunt over Germany was their general cultural refinement. The art nouveau design movement flowered all over Europe, and its most sophisticated practitioners were probably actually in Belgium. But the country it really left its mark on was France: in Paris (think of those quintessentially Parisian metro stops). The identity of Paris is bound to the fin-de-siècle period – it’s what we all think of when we romanticise it – partly because art nouveau became the hook on which the French hung their national identity at a critical moment in their history: the solidification of the Third Republic. And if you look into French art nouveau this way, through the lens of a German-centred inferiority complex – you discover some quite striking things. They were obsessed with the idea of French ‘grace, charm, and elegance’ as being innate national characteristics. This was partly in opposition to what they saw as being the hyper-masculine, heavy, Germanic style, and anything perceived as being ‘heavy’ in this period gets very short shrift from French critics. But they were also drawing here on the house style of Marie Antoinette, ‘Rococo’, which, for the French Republic (ironically), was their only available shorthand for power and glory. In order to assert their position as artistically superior they fall back on a time when they actually were: when the French court set the trends that the rest of the world followed. They were preoccupied with health and fitness. This was partly a genuine reaction to the increasingly sedentary lives of the people of an industrialised nation: this is when we see the rise of the first bodybuilding magazines. But it was also quite common at the time for writers to use the body as a metaphor for the country. A critic called Hippolyte Taine claimed that their recent fall from power revealed that the French body was truly sick. So the worst criticism that connoisseurs can level at a designer is that of producing ‘unhealthy’ forms. They also liked to read their political ideals into their furniture, which they believed were qualities like ‘reason, logic, moderation’, qualities they definitely did not see in Germany. It would be quite hard to draw a picture of a table embodying such qualities as health, vigour, femininity, reason or moderation: which shows you that these weren’t factual descriptions at all, but symbolic commentaries. And ones which revealed some important national anxieties. Unfortunately for France, which put all its eggs in the artistic excellence/ luxury products market, the real industrial powerhouses of the twentieth century turned out to be those that focused on excelling at mass production. France, defensively, fell back on its ‘tastemaker’ laurels at exactly the moment it should have been innovating. Whilst all this is interesting for being an unusual analysis to put on art nouveau, what is perhaps more valuable is to think about modern-day parallels. In the 1890s, the renewed focus on national production in France came at the same time as some particularly unsavoury outbreaks of nationalism proper (the Dreyfus affair and General Boulanger for those who know their French history!) This rings some bells in terms of the UK today. Recently we’ve seen increased support from government for UK manufacturing at the same time as the rising popularity of isolationist parties and this stupid question of ‘leaving’ the EU. You could see these things as different manifestations of the same spectrum of sentiment: patriotism at best, racism at worst. Now, as then, these nationalist wobbles are in the context of a period of rapid technological change. If the history of France and art nouveau should teach us anything, it is that this is not a time to batten down the hatches and rely on old formulas. If you want to read a much longer discussion of this subject, you can download the essay I wrote for my MA here (the last one). Last week, as well as one real life, slightly freckly one, I took two literary companions with me to the beach. Iris Murdoch (The Bell, since you ask, and thank you Jan Casey for the inspiration), and a certain Erik Larson. Murdoch’s company was, as expected, faultless, with just the right mix of humour, melancholy and human fallibility – and some provocative reflections on the psychology of catholics. I entirely agree with this reviewer. Larson was more of an unknown quantity, but, as it turned out, an intriguing one. The book in question, ‘The Devil in the White City’ (and in this case many thanks to David Kester for the recommendation) is a very individual account of the ‘Columbian World Fair’ built by Chicago in 1893 to celebrate the 400th anniversary of Columbus setting foot on solid ground. America’s 400th birthday party, and an attempt to prove to the rest of the world it had come of age. It followed the example of previous such World Fairs/ Great Exhibitions/ ‘Expos’ in inviting contributions and displays from all nations, and foregrounding developments in science, art and technology. It made history for – among many other things – the invention of shedded wheat, and the Ferris wheel, Chicago’s answer to Paris’s scene-stealing Eiffel Tower unveiled at their own world fair of 1889. But its USP, as it were, hinted at by the name, the ‘White City’, was its sheer scale and distinctive architectural presence. All neo-classical, all whitewashed, it struck a remarkable contrast to neighbouring Chicago proper (dark, filthy, dangerous), and became a ground-breaking demonstration to Americans that their cities might be places of beauty as well as commerce. The unique thing about Larson’s book is his approach to this subject: his is, in fact, a story of two men, told in parallel. A tale of two of history’s great creative minds and powerful personalities, bent on very different ends. One, the architect who envisioned and built the fair, and the other, the psychopath who carefully seduced and destroyed unworldly young women who came to Chicago to see this most awesome of 19th century spectacles. Actually, if I had one criticism of the book, it is that the two narratives, apart from their simultaneity in place and time, seem really to bear scant relation to one another. Both are fascinating, but neither gains quite enough by being interwoven with the other to warrant the effort. However, I can understand the irresistible temptation of this project for the historian, this mission into the past to reconstruct – and compare – the doings of two compelling characters. And in fact the combination of architectural history, murder and inept 19th century policing made great beach book fodder. Highly recommended. It is also essential reading for anyone with an interest in the curious phenomenon of world fairs. Larson does a great job of conveying the Jules Verne-esque ambition and theatricality, and the patchy distinction between the real, the exotic and the mystical that was a feature of Victorian thinking. It was a time when ambitions were rarely tempered by reality, because reality was changing so quickly: if men were now able to make light without a flame (electricity), and build babel-like towers out of steel, what other equally improbable things might turn out to be possible? It must have been an exciting time to be alive. Having recently familiarised myself (for the purposes of essay-writing) with the Parisian Expos of 1889 and 1900, I have begun to suspect that the fact that we still have a globe-trotting merrigoround of ‘World Expos’ – the modern day descendants of these 19th century circuses – blinds us to the enormity of the spectacle they must once have been. Kicked onto the world stage by our very own Prince Albert in 1851, the world fair tradition provoked the technical advancement (including in warfare) which has eventually erased its own relevance. With the immediacy of access to knowledge about the rest of the world that we now have, via screens if not through actual physical travel, the World Expo as an event has presumably lost at least part of its power and meaning. If we want to know what China is manufacturing or what a certain African tribe believes – it’s pretty easy to find out. But back then knowledge of the world was a privilege few could access. The fairs opened it up to the masses. Even longer ago than our own generations the magic of the fair must have started to wane. After the First World War, only 20 years after Paris was captivated by electric light shows for the first time, the world must already and suddenly have seemed a far less mystical and enticing place. But can we recreate what the spectacle of the fair signified to Victorian eyes? Can we imagine the sheer gobsmacking amazement that must have accompanied the sight of – for example – entire Pygmy tribes in mock-up huts on the banks of the Seine, of a steel and glass palace enclosing giant oaks in Hyde Park, or of the rapid construction on the shores of Lake Michigan of a gleaming white city? I think the resonance of these affairs is still just within our grasp – but for how much longer? With all the recent WWI centennial activity, someone ought to bring this 19th century phenomenon into the popular spotlight. There are historians aplenty to do the talking heads bit. And, most wonderfully, Thomas Edison can supply all the footage. Effecting structural change through design? Not in the day job.